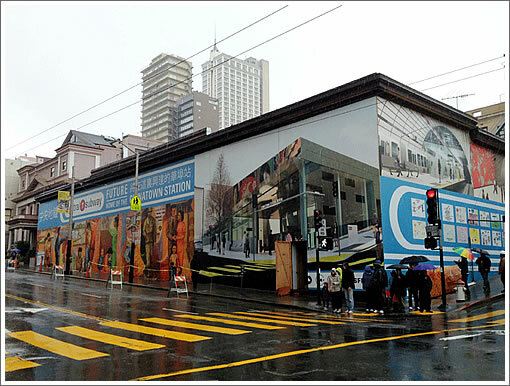 With bids to build the Chinatown Station for San Francisco’s Central Subway due May 8th, and construction scheduled to be completed by the end of 2017, the now-vacant building at 933-949 Stockton Street that was acquired by way of eminent domain to make way for the station has been wrapped for its protection prior to being razed later this year. The solicitation for bids to build a $189 million Union Square/Market Street Subway Station is expected to be advertised next month. 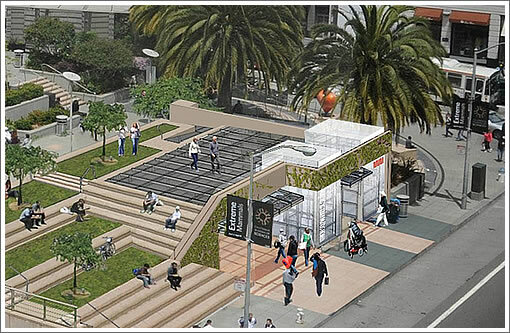 So why can’t the new subway stations be like the existing ones at Embarcadero, Montgomery, etc, where there are just entrances in the sidewalk for escalators? Why is there a need for an actual above-ground “station”? Seems like a waste of (valuable) land if the station can be underground instead. ^^^ From the last ortho perspective diagram it looks as if the above ground “building” itself is only the size of a small quickie mart. The rest of the site seems to be a little park. It couldn’t have been much smaller. I don’t have a problem with the size of stations. If the proposals for the Chinatown one live up to the rendering, then it’ll be a good addition to the neighborhood. And the Union Square one looks really small. The last rendering is for the Union Square station, and it’s very nice the way they’ve incorporated the station into the square. My question is more with regards to the Chinatown station, where they had to use eminent domain to get the land for the new station. I don’t understand why an above-ground station is even needed there, when it seems an underground station would do just fine, like at Castro, Church St., Van Ness, etc. Du-oh ! You’re right. My mistake. The station entrances on Market are as wide as a Chinatown sidewalk, you just don’t notice it because the siddewalk on Market is that much bigger. So this seems reasonable. I’m just sad to see a multi-use, multi-story building give way to a single-use box. Not the way to maximize urban space. Sure, put the entrance in a building– that’s logical, when there’s little room on the sidewalk. 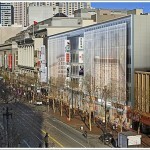 But the building can also house some commercial space, or apartments, etc., instead of being a large glass box. And then those functions would help pay for the subway. Win-win. Instead, they get a large “artistic” architectural statement, lacking all purpose. On top of that, it’s a lot more expensive to maintain. Great. Heck, Bart should do the same with the 16th St. and 24th St. plazas. Now the Union Square station is just fine. So I’m in agreement that the Chinatown station should have a big condo or apartment building built on top of it, at least they could earn back a little money that way and get better use out of the land. They’re going to need that money once they have to start paying to maintain and operate this new line. It’s true that in dense cities you can make a big project pencil out by making a subway station the core of something bigger. See what happened with the Haussmann station in Paris in the 90s where they totally revamped the neighborhood with shopping centers and office buildings. If we looked at money only, nothing would be built, because the investments are huge and not all benefits are really tangible. Better transit improves life in SF and attracts even more talent. It’s hard to quantify that. At least work is moving along. Another big story for SF: the subway is becoming 2-dimensional! 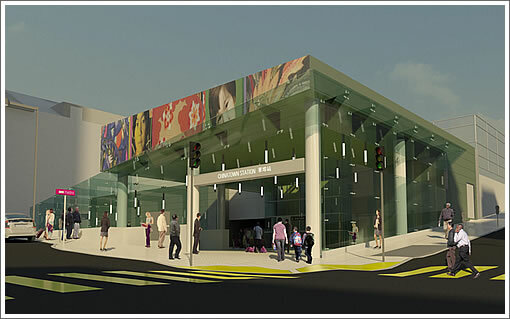 There will be underground transit outside of the Market Street corridor! I think it’s a fantastic project and I hope they’ll do more of these for other N-S paths. There should be a line all along Van Ness from BH to Ghirardelli Square for instance. But this new line is a great start. In a world where hundreds of billions of dollars are lost, unaccounted for and never paid back, (BofA,G.Sachs, Madoff, etal) and in that relatively short time frame also produce nothing of material value at all, this project suddenly ranks in my mind as a truly progressive human endeavor, where at least we get, after spending only a couple of billion, an alternative way to move through a very dense part of the city from an area that stands to grow the most and, as a bonus, at least two nice subway stations. Cant say the same for the what the victims of the titans of finance will get. Well if you have just an escalator/stair entrance from the street you need to have a larger underground station to host the agents booth, the ticket machines, the entrance gates, the elevator equipment, etc. If you host most of that in a small building above ground then it shrinks the footprint of the underground portion of the station since you just need the space for the trains, platforms, and rider access. For the MUNI underground on market street, market is a very wide street and with BART under there as well there was plenty of space for the underground footprint. I suspect having above ground station buildings on Stockton is actually cheaper then digging and building a larger underground footprint there. The “cost” of the Union Square space is basically free since it is already city owned land which then means they really only needed to get the space for the Chinatown station. Considering they would likely have still needed surface space for an elavator plus venting/air intake equipment the cost for the additional space needed for a station was likely drastically less then the cost of more digging & building underground. I do agree that they could have expanded upwards and had the chinatown station be most of the ground floor of a taller building. I work for the Muni design division, and the reason we did not put anything above the station is because it would block Rose Pak’s view. WTF!?!?! a single story station entrance over that huge lot??? are they nuts?? uh, earth to planning, invitation to blight calling, beam in a minimum 3 story mixed-use development. this particular yimby will be making his position known at whatever meetings he can make, i’ll tell you that. as for union square, the more interesting aspect of this predictable station entrance if the nice re-organization of the sidewalk at the corner of stockton and geary, not the bulb-out that we saw on the post st elevations, but very nice to see it all cleaned up. I you fully read my post, I did not question it was a huge step in the right direction. Just that there’s a way to get more bangs for your bucks. But building more would probably have been much more complex (love tipster’s post, by the way). Those stations remind of the ones built in Vancouver, BC. for the Olympics. Can’t wait to see how the central subway will look like wants it’s all built. I agree with everyone about the misuse of space in Chinatown. Spaces in San Francisco are scarce and to use that entire space just for a station is ridiculous. Mayor Lee, change it up! I went on the tour for the south end of the central subway, and Yerba Buena Station will also be a 1 story structure. I asked the MTA staff that was on the tour with us why they didn’t decide to build a multi-use structure for the site, and I was told that the MTA would be willing to do that but a private party would have to be willing to fund the entire station project for that site. Obviously, so far no one has stepped up. I’m not sure about the China Town station, but the Yerba Buena (or Moscone, as the official name) station will be a simple cut and cover station which is expensive to build a large structure over. If I’m not mistaken, the stations/buildings are needed for multiple elevators to transport riders down to the platforms, because they are in the neighborhood of +60 feet below street level. One of the early complaints of the whole project to begin with. There may also be a plan to house some subway infrastructure, like the ventilation exhaust/intakes for the tunnel, in the station buildings like the one rendered for Chinatown. The exhausts for the current BART/MUNI are in the middle of Market Street. You can see an enormous grill taking up much of the 5th and Market intersection. When that exhaust goes off, it blows dust and paper all over. That might be considered a little harsh for the 30 odd foot width of Stockton Street in Chinatown.